BMW’s fourth-generation X5 will go on sale in the UK later this month, priced from £56,710 on the road. 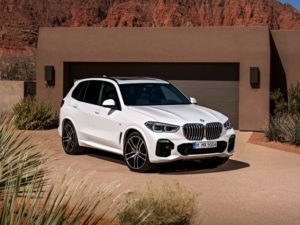 Longer, wider and higher than its predecessor, the newcomer launches ahead BMW’s new flagship X7 SUV and will be offered in a choice of off-road styled xLine and the typically more popular M Sport trim levels. From launch, the European range will include three engines. The xDrive40i is the only petrol version, returning 33.2mpg and offering CO2 emissions from 193g/km, while diesels comprise the likely best-selling xDrive30d (47.1mpg, 158g/km) and the M50d (41.5mpg, 179g/km). All feature an eight-speed automatic gearbox, and four-wheel drive. Both diesel engines are fitted with selective catalytic reduction (AdBlue injection), while the petrol unit features a particulate filter, meeting the latest Euro 6d Temp emissions standard. BMW said last year that it had copyrighted the iX5 badge, hinting that a plug-in hybrid or fully electric version is also en route – as in the smaller X3. New technology includes the latest assistance features, an optional off-road package and BMW’s Laserlight headlights, with beams that spread in an X pattern. The X5 also gets the same 12.3-inch iDrive display as in the 5 Series, with the option to add gesture control, as well as seven seats and a two-piece tailgate, opening onto a boot with a load cover that retracts electrically into the floor.